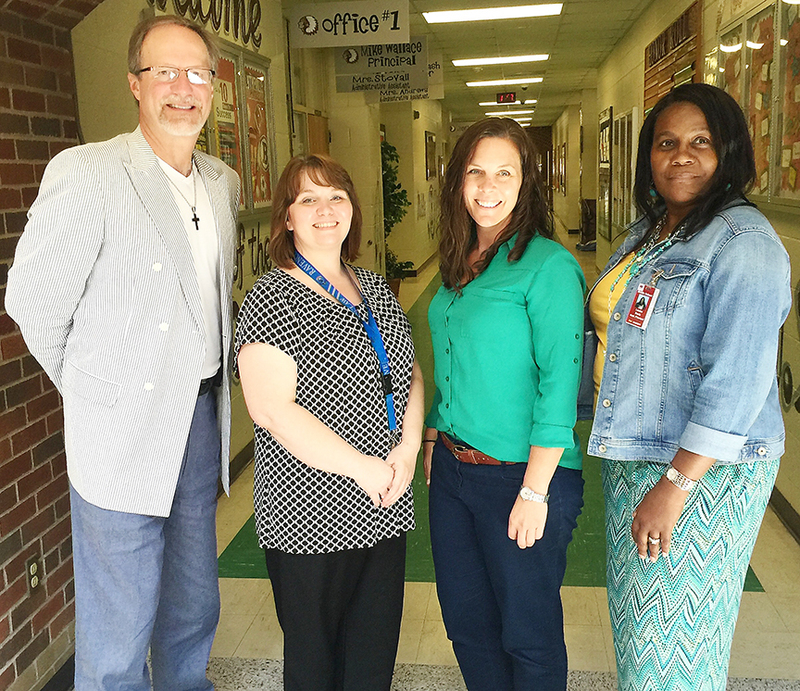 Heather Hester, new developmental coach for Blytheville Middle School New Tech, pauses for a photo with (from left) BMS principal Mike Wallace, Blytheville High School New Tech director Robin Snead and assistant principal Louise Davis. Hester, from Indiana, will make four more trips to BMS during the school year. As Blytheville Middle School transitions this school year to that of a New Tech school, starting with the eighth-graders, Heather Hester hopes she will make a positive difference within the building and help the teachers to instruct their students in the most beneficial ways possible. Hester, from Indiana, spent Sept. 8 touring BMS as part of her duties as developmental coach for BMS New Tech. She met with the school’s administrators, sat in on several classes and collaborated for a short time with the teachers at the end of the day. Hester taught seven years in a middle school and another seven in a high school that emphasized project-based learning. Hester works for New Tech Network, whose office is in Napa, CA. She said that the first New Tech School began with several high schools 20 years ago, and it opened up with middle schools approximately six years ago. Hester also spent the day with Robin Snead, the Blytheville School District’s New Tech director. Snead will be helping to support implementation of the New Tech model at BMS while sustaining the model at Blytheville High School. She stated that Hester was very positive about what she saw at BMS. “"Your kids are awesome!”, Snead said Hester told her. “They are so well-behaved and so very polite." “Ms. Hester had conversations with students in almost every class we visited, and the students were able to explain what they were working on and how it related to what they were doing in the class as a whole. The students were doing a very good job of navigating through ECHO, New Tech's learning management system. Snead added that before leaving, Hester stressed that she would like BMS teachers to contact her. “Heather is our liaison to the network, and she can help provide resources and offer feedback on project ideas”, said Snead. “She also plans to set up virtual meetings with all of the teachers in the near future. “In addition to the virtual meetings, Heather will be visiting our campus a total of five times throughout the school year to offer support. Heather, (Mike) Wallace and I will remain in contact between these visits so that this support is ongoing. Hester went on to say that she hopes one of the school’s goals is to implement new projects for the students and also to build collaborative goals for the students and teachers. “I want to provide the opportunity for students to have positive interactions as part of New Tech,” she said. “The New Tech Network has school-wide learning outcomes, and those are outcomes we hope every student who graduates from the network would have.” Those outcomes include written communication, oral communication, collaboration, agency, knowledge and thinking. When the district first implemented New Tech at BHS, Snead was still a high school teacher, so she has experience as a New Tech teacher. “With this experience, I hope to be able to answer questions and smooth BMS’ transition from traditional, lecture-style instruction to the student-centered, project-based instruction that emphasizes learning outcomes that students will need beyond middle and high school”, Snead said. Hester will provide a connection to the New Tech Network by answering any questions a teacher or administrator may have. Hester added that if she cannot answer a particular question, she will find somebody in the network who can.